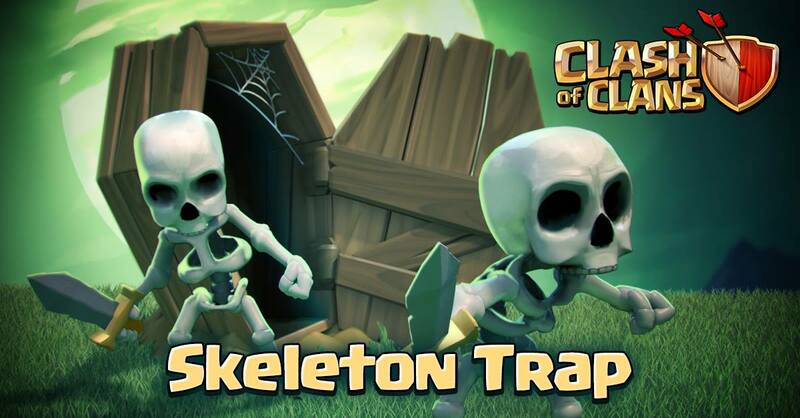 The Skeleton Trap is one of many Traps in the Clash of Clans game. Skeleton Traps are structures that remain hidden until they are activated by an attacking Troops moving into their trigger radius. Once triggered, the coffin rises from the ground and multiple Skeletons appear in the area around the coffin to attack nearby Troops depending on whether it is set for ground or air troops. You can see the difference above using the Toggle Mode feature. They can be configured to attack either ground or air troops. They will remain invisible if set to ground and an air Troops passes over (and vice versa). The number of Skeletons released depends on the level of the Skeleton Trap. 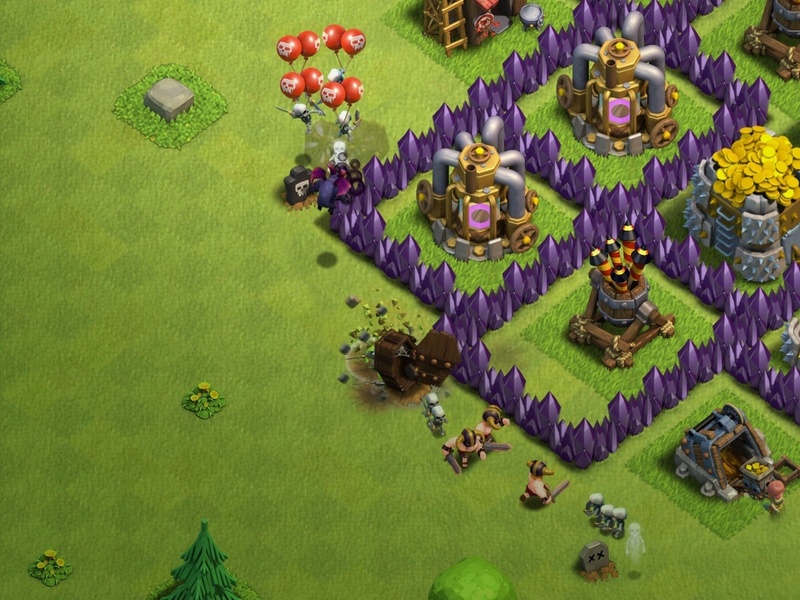 The Skeletons released have a small skull icon next to them to signify they came from a Skeleton Trap (as opposed to being summoned by a Witch), similar to the icon displayed next to Clan Castle troops. The reason behind this is because they play an equal role to the Skeletons summoned by a defending Witch in the Clan Castle. The Skeletons from the trap have exactly the same stats as the Skeletons summoned by the Witch. Skeleton Traps set to defend against air Troops have wings instead of a skull on the face of the coffin. Skeletons that arise from being triggered while set to defend against air Troops float through the air with the aid of two small red balloons, the same balloons as those on the Air Bomb. Initially, Skeleton Traps are a light shade of brown and have a skull or a bat-like figure on the face of the coffin. It is boarded up, indicating that the skeletons were possibly once people. At level 3, the Skeleton Trap is a darker shade of brown and has five brass studs on the face of the coffin. A short, dark brown board connects the coffin together at the top. After deploying, the coffin quickly disappears. Scorch marks on the ground where the Skeletons clawed up through the ground disappear a short time later. Skeleton traps are currently the only Traps that can target ground or air Troops. Skeletons deployed appear to be identical to the Skeletons the Witch summons, except when they are in Air Mode, which gives them 2 balloons attached to their necks. You can tell if they are the Skeleton Trap’s Skeletons because they have a skull next to their health bar, and unlike the Skeletons summoned by the Witch, their health bar is permanent. Skeleton Traps were added in the 2014 October 22 Halloween update, but are a permanent addition that will remain available after the holiday has passed, unlike special traps in previous years as Pumpkin Bomb and Santa Strike. From the Halloween update in October 2015 there are five hidden Skeleton Traps were added at the #27 Obsidian Tower map of the Single Player Campaign. Look for them near the Halloween’s Headstone at the bottom corner. 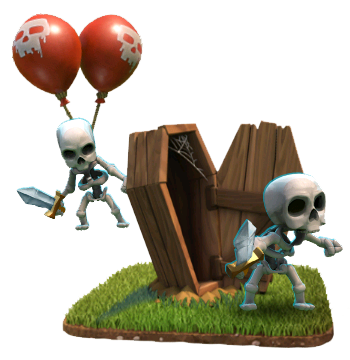 Skeleton Trap can be placed in the center of your base near the Town Hall, then the troops that are going to destroy it, activate trap, and will be distracted by Skeletons, instead of attacking the Town Hall. – This icon is only displayed while the Skeleton Trap is in Ground Mode. Tapping this icon switches the Skeleton Trap attack mode to attack Air Units. – This icon is only displayed while the Skeleton Trap is in Air Mode. Tapping this icon switches the Skeleton Trap attack mode to attack Ground Units.